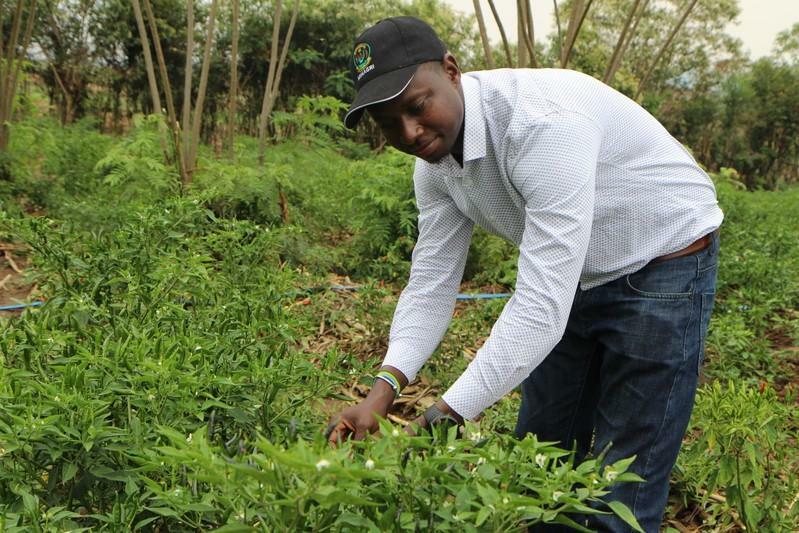 TechInAfrica – A 30-year-old Rwandan entrepreneur, Dieudonne Twahirwa is running Gashora Farm in Bugesera District. He has changed the image of farming, particularly in Africa through his farming business. Unlike common farmers, he wears casual clothes while driving a four-wheeled drive to navigate Rwanda’s bumpy back roads. The way he does it changes the stereotype of African farmers. Twahirwa bought his friend’s tomato farm in 2012 for US$150. Only within two months, he was able to make $1,500. As for this achievement, he said that he tried to link it (farming) with entrepreneurship and real numbers. Gashora Farm focuses on chili plantations. Over 1,000 farmers work for Twahirwa to produce chilies. He is currently working on his fourth farm and export fresh and dried chilies and oil to other countries, such as Britain, India, Kenya, and the United States. In Rwanda, climate change has made working in the field even harder. As a result, many young African forgetting about it, especially in rural areas. Despite the fact, Twahirwa has succeeded in reforming the image of agriculture’s image in Africa. Other than Twahirwa, there are some other young entrepreneurs who also run a farming business. One example is a relative of Zambia’s first president who runs Billionaire Farmer Agric Solutions. He supplies vegetable seedling in Zambia and in some of the neighboring countries. Speaking of African agriculture, Africa has 65% of uncultivated land while the access to land and loans is fairly difficult. According to UN, the crop yields of African agriculture productivity is only 56% of International agriculture, which is considered low. Experts say that using technology to run a farming business is a way to make young entrepreneurs attracted. Moreover, it can also bring a good impact on productivity. A group of international agriculture experts, the Malabo Montpellier Panel said that around 50% – 85% of Africa’s farm work done manually. Thus, using technology can be a solution to change the old way of getting farming work done which also leads to productivity. However, the business does not go smoothly without any challenges. Due to climate change, farmers have to face longer dry periods, erratic rainfall and floods which lead to crop loss and yield declines. Therefore, something should be done to address this. According to a Rwandan tech entrepreneur, Yan Kwizera, political leadership is highly needed to overcome this challenge.